In short, Fexmax is an advertising solution for brick-and-mortar businesses who wish to communicate with their customers via a Bluetooth device. In many cases, these Bluetooth devices are phones. Fexmax essentially sends Bluetooth messages to telephones with the Bluetooth connectivity turned on. The messages can be simple text messages or more complex media such as videos or images. 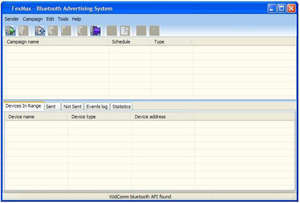 FexMax 3.0 is a shareware program and can be used as a demo to try the software until the free trial period has ended. A full version of the program is available after the trial period ends. For security reasons, you should also check out the FexMax download at LO4D.com which includes virus and malware tests. Additional screenshots of this application download may be available, too. FexMax has a presence on social networks.